If you’ve been lied to, betrayed, cheated on, abused, manipulated, abandoned, assulted used–if you’ve ever felt worthless or helpless or powerless to make a change– if it feels like your life is a story on repeat of being undervalued and under-appreciated– this book is for you. Come learn a process for getting unstuck in any area of your life. A day-long event using the three most powerful tools, according to research, that can help you get unstuck with your relationships, your finances, your career, your physical or emotional health, your friendships, your faith, your creativity, or your confidence. Come enjoy a day of laughter, discussion, delicious food, coffee and pastries, and the three most powerful tools available to you to retain your brain and get you…for you. More love, less fear and more of what you want out of your life. This short 8-part guidebook will give you a few simple steps you can take next time you’re heartbroken to keep you from feeling totally hopeless and help you leverage your heartbreak for your own love, healing and progress. 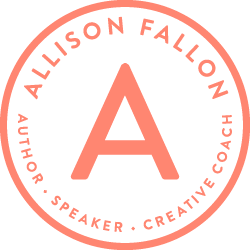 Spend a day with Allison one-on-one to outline your book, chapter by chapter. I’ve helped hundreds of authors–from total beginners to New York Times Bestsellers– to outline, write, edit and publish their books. I can help you, too. Whether you’re a long-time writer who is feeling stuck, with writer’s block, or a brand new writer experimenting for the first time, these resources are specifically designed to help you get your creative energy flowing and keep it flowing. Not only will this help you figure out what you’re trying to say and get your words on paper, as a happy benefit, research shows that it’s also bound to improve your relationships, your sleep, your self-confidence and measurably improve your mood. Whether you’re a long-time writer who is feeling stuck, with writer’s block, or a brand new writer experimenting for the first time, these resources are specifically designed to help you get your creative energy flowing and keep it flowing. Not only will this help you figure out what you’re trying to say and get your words on paper, as a happy benefit, research shows that it’s also bound to improve your relationships, your sleep, your self-confidence and measurably improve your mood. This resource is a beginner’s guide for anyone who wants to try writing as a regular, daily practice for improving mental and emotional health. These 7 simple writing prompts give you a painless way to get you started writing about the topics that matter to you.